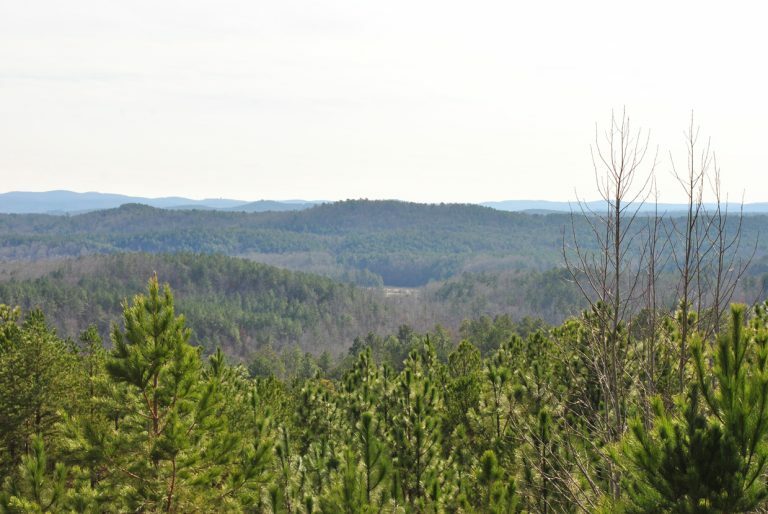 Known as Talladega Scenic Drive, Alabama State Route 281 travels on its 26.33 mile course from Adams Gap in Clay County to U.S. 78 west of Heflin. 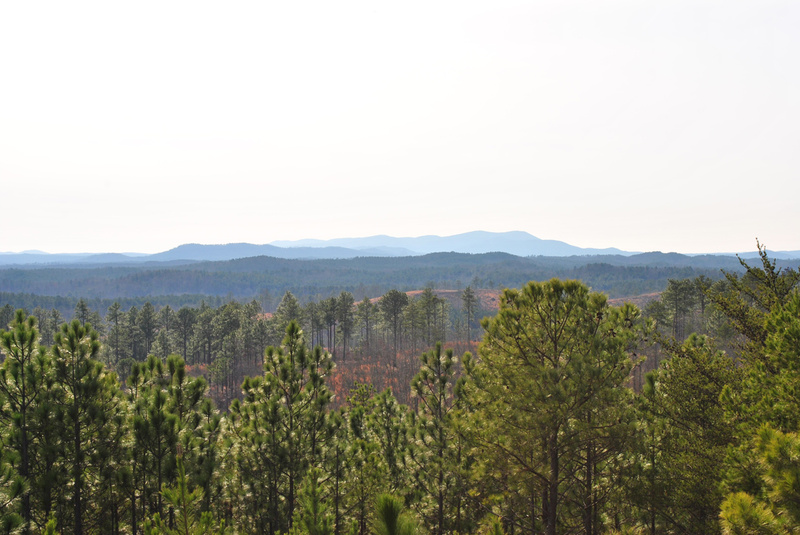 Traveling through Talladega National Forest and Cheaha State Park, mileposts along SR 281 range from 470.762 to 493.752. Alabama 281 runs along the west side of Talladega Mountain from Adams Gap seven miles to the main entrance for Cheaha State Park. Photo taken 01/21/13. An I-20 trailblazer and guide sign direct visitors leaving Cheaha State Park to SR 281 north to Heflin via U.S. 78 and south to Talladega via CR 12. Photo taken 01/21/13. SR 281 turns southward through a horse shoe curve beyond the entrance to Cheaha State Park. Photo taken 01/21/13. Advancing a half mile, SR 281 turns east at the Cheaha Trailhead parking area. Photo taken 01/21/13. SR 281 navigates through a series of horse shoe and S-curves on the northern drive out from Cheaha State Park to SR 49. Photos taken 01/21/13. Approaching the north end of SR 49 on SR 281 (Talladega Scenic Drive). Photo taken 01/21/13. Alabama 49 travels 14 miles south from Alabama 281 to Lineville and 83 miles overall to Interstate 85 in Macon County. Photos taken 01/21/13. A grade separated intersection links U.S. 78 & SR 9 with SR 281 south by the railroad siding of Cleburne in Talladega National Forest. Photo taken 01/21/13. SR 281 crosses over U.S. 78 & SR 9 on a 1979-built overpass ahead of the first southbound shield assembly. Photo taken 01/21/13. Gaining 200 feet in elevation, SR 281 winds southward from U.S. 78 onto Horseblock Mountain to the first scenic overlook. Photo taken 01/21/13. 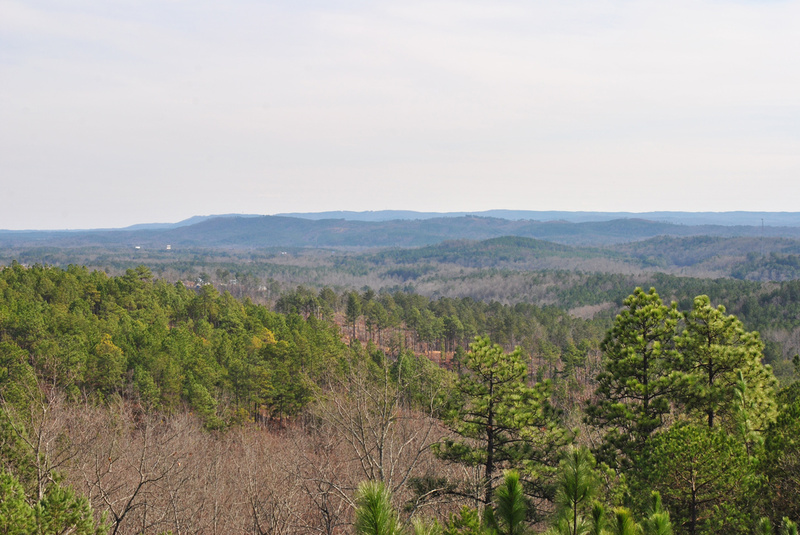 A second scenic overlook on Horseblock Mountain lies 0.9 miles south of U.S. 78. Photo taken 01/21/13. 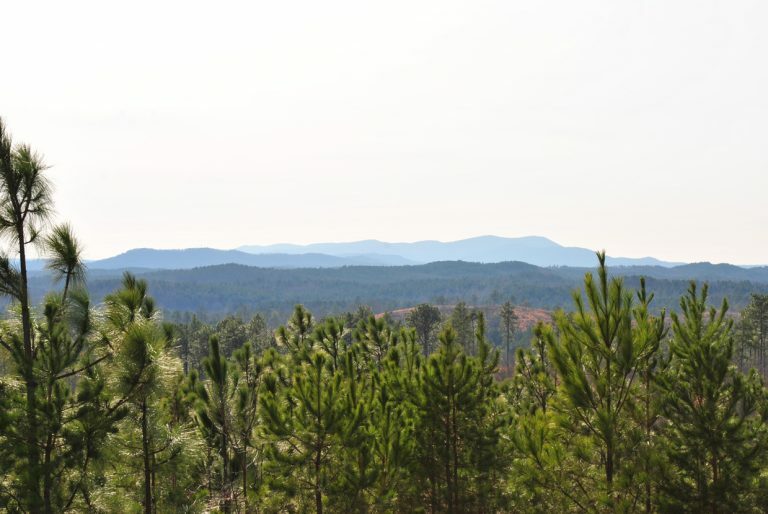 Cheaha Mountain, the highest in the state of Alabama at 2,405 feet above sea level, rises to the southwest of Horseblock Mountain. Photo taken 01/21/13. A number of S-curves take SR 281 (Talladega Scenic Drive) southwest from the second overlook 2.5 miles to I-20. The state route peaks at 1,243 feet above sea level on this stretch. Photo taken 01/21/13. Lowering to 1,000 feet above sea level, Alabama 281 crosses over Interstate 20 with no direct access. Photo taken 01/21/13. The bridge spanning I-20 along Alabama 281 was built in 1969. Photo taken 01/21/13. Alabama 281 crosses Interstate 20, 0.752 miles north of mile marker 493. Photo taken 01/21/13. Continuing southwest along Horseblock Mountain to mile marker 492. Photo taken 01/21/13. A 1978-built overpass carries Alabama 281 (Talladega Scenic Drive) across U.S. 431 near Five Points. County Road 131 links the two highways a the ensuing intersection southbound. Photo taken 01/21/13. SR 281 shields located at the south end of unsigned CR 131. Photo taken 09/29/03. Talladega Scenic Drive winds 11 miles southwest from CR 131 near Five Points and U.S. 431 to Cheaha State Park. Photos taken 01/21/13. A third scenic overlook on Horseblock Mountain follows on SR 281 southbound at an elevation of 1,385 feet above sea level. Photos taken 01/21/13. Mile marker 488 stands along Alabama 281 south near Morgan Lake and Abel Gap. Photo taken 01/21/13. Alabama 281 curves southwest to a grade separated intersection with County Road 24 at Abel Gap. Photos taken 01/21/13. County Road 24 branches west from U.S. 431 near Hollis Crossroads to Abel and Alabama 281. Crossing the Calhoun County line to the northwest, CR 24 becomes Jennifer Lane leading to the outskirts of Oxford. Photo taken 01/21/13. Reassurance marker posted south of the connector with County Road 24 at Abel Gap. Photo taken 01/21/13. 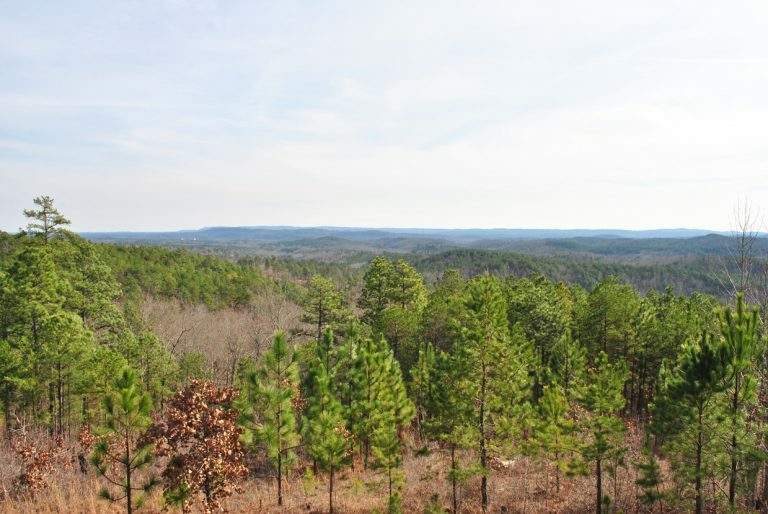 Alabama 281 climbs around 400 feet in elevation on the four mile drive south from the CR 24 underpass to the Cheaha Scenic Overlook. Photos taken 01/21/13. Blue Mountain and Cheaha Mountain rise just west of Horseblock Mountain. Photo taken 01/21/13. Alabama 49 ascends from Shibone Valley to conclude at Alabama 281 just inside Cleburne County. Photo taken 01/21/13. Leading south from the wye intersection with Alabama 281, Alabama 49 travels 14 miles to the city of Lineville. The Tallapoosa County seat of Dadeville lies 39 miles further. Photo taken 01/21/13. SR 49 extends 83 miles south from SR 281 to Interstate 85 near Tuskegee. Photo taken 01/21/13. SR 281 navigates through a pair of horseshoe curves on the three mile drive from SR 49 to Cheaha State Park. Photos taken 01/21/13. Southbound Alabama 281 (Talladega Scenic Drive) reaches Cheaha State Park at the Cave Creek Trailhead. Photo taken 01/21/13. Turning north, Alabama 281 climbs 190 feet on the half mile stretch leading to the Cheaha State Park Campground, restaurant and motel. Photos taken 01/21/13. This reassurance marker stands beyond the main entrance into Cheaha State Park. Photo taken 01/21/13.